Mr B and I went to town today. I mean this in its simplest sense - we didn't go on a spending spree, or paint the town red (where did all these expressions come from, I wonder?) No, we went to town. On a bus. Regular readers of the Daily Blog will know that my free Bus Pass is one of my Most Treasured Possessions. Mr B took a little while to be persuaded that he needed a Bus Pass. Three and a half years, in fact. That's the difference in our ages, you understand - and he simply refused to apply for a pass until I, too, hit the magic age of bus pass qualification and marched him down to the Town Hall so that we could sign up together. From that moment on, we were both, officially, Twirlies. If you haven't heard that expression before, then I need to explain. In West Sussex, where we live, you can't use your bus pass before 9.30 a.m. Bus drivers lament the fact that every day they will pull up at a bus stop at, say 9.25 a.m. to be greeted by a smiling pensioner, waving his / her bus pass, and enquiring winningly: "Am I t'wirly (too early)?" We do try not to be twirly, Mr B and I. We like to keep our friendly bus drivers happy, even if the majority of them won't wait the bus for us when they see us scampering along the road, waving wildly because, in our anxiety not to be twirly, we have set out from home too late. 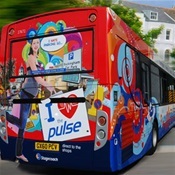 However, because we are lucky enough to live more or less on the route of a bus called "The Pulse" we only usually have to wait ten minutes at most for the next bus. And one of the best things about being retired, you know, is that there is generally no need to hurry. Anywhere. I love the equality of bus travel. Cars tend to give away quite a lot about their owners. There are the cars with the Go-Faster stripes for the Boy Racers; the sedate saloons or hatchbacks for the Family Man / Woman, with littl'uns peering out of the back windows wondering if they're "there yet"; the luxury models with blacked-out windows for those who take pleasure in seeing their fellow motorists gawping in a bid to glimpse Somebody Famous inside; the stretch limos for the party-goers; the outdoorsy types with mountain bikes strapped on the roof of their 4x4s. But on the bus, we are all equal, all the same. We are all united in our common purpose. To arrive. What's more, buses today are quite amazing in their accessibility. They "kneel down" to enable the wheelchair, the push-chair, the guide dog and their owners to enter with ease. Having, as a young mother, experienced the trials of bus travel in the late 60s / early 70s, I appreciate the fact that today's mums and dads have life a bit easier. At least on the buses. I think people are more courteous, more accepting of others, when they travel by bus. Mr B most certainly is. Behind the wheel of the car, he treats every other car driver as the enemy - they drive too fast, they drive too slowly, they dither at roundabouts, they don't obey the highway code with regard to motorway driving, they fail to signal in a timely fashion. Most of all, they have the temerity to drive along our road at The Very Moment when he is reversing out of the drive. On the bus he is jovial, relaxed and happy (for the most part) to be a passenger. Occasionally he even nods off to sleep / rests his eyes. Something else you can do on a bus, but not in the driving seat of a car. Most people smile at their fellow passengers. They vacate their seats at the front of the bus if a tired looking mum with a pushchair and three little ones in tow gets on. Almost everyone thanks the driver as they alight. "Cheers!" "Many thanks!" or, quite often, the strangely formal: "Thank you, driver!"